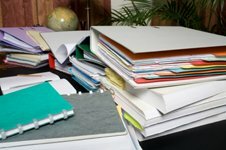 Home office organization is vital to your home based businesses’ success. Do you waste valuable time clearing off space on your desk in your home office just to work? A messy unorganized home office not only zaps your time, but your energy and attitude too! Valuable energy you need for your work, yourself, and your family. Who wants to walk around tired, discouraged with a bad attitude? No one! To keep productivity levels high when working at home, make home office organization a priority. This can be hard because when you're at home versus a dedicated office space in the outside world, other areas of life can sneak in. Don’t let them and you will maintain a high level of energy and focus that you can put into your business increasing productivity levels! Now, once you’ve followed all the tips on the pages listed below and have a good system of organization in place and are able to maintain it, you will increase productivity and save time. Time lost trying to find things and time lost clearing off your desk just to work! Your energy will no longer be drained from a messy office space and your attitude will soar! When you’re done, you will have created a system of organization for each of these that will eliminate clutter and keep you organized and productive. And remember to keep the personal stuff out of your home office. You’ll want to separate and segregate your personal stuff from your professional stuff. Don’t allow your personal bills, kid’s schoolwork, personal mail, etc. to creep into your home office space. You will maintain focus better if your home office space is dedicated strictly to home office stuff. You’ll also want to maintain your home office space on a daily basis. Keep it simple and each day you should spend about 10 minutes keeping the office space well organized. Go through the mail and toss, file, or act on it. At the end of the day, throw away things you don't need and reorganize your desk before you quit working. Also, be sure to write out a "To Do list" at the end of each day so when you walk into your office the next morning, you'll have a handy reminder list of things to work on.